The Friends of Stoneydown Park (FoSP) are committed to keeping the park a place that is friendly, welcoming and pleasant for everyone who uses it. Stoneydown Park is an attractive, well-used space in the heart of the Blackhorse Road area of Walthamstow. 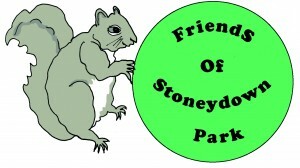 Membership in the FoSP is open to anyone who has an interest in the having a say in what goes on in Stoneydown Park and wants to be involved in their local community. Over the years, the group has successfully campaigned and raised funds on behalf of the park and those who use it. We have worked to bring about many successful events and activities in the park, including hosting the annual Stoneydown Park Folk Festival, participating in the E17 Art Trail, campaigning for new play equipment and organising many family-friendly events and activities. FoSP volunteers open up the park hut to enable park users to borrow from our collection of toys, games and sports equipment, as well as to access the toilet and tea and coffee making facilities.